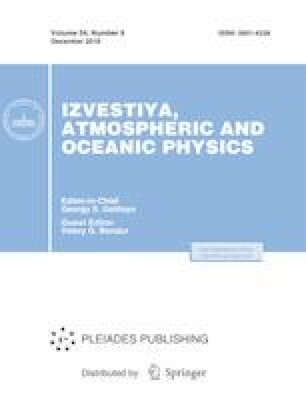 This paper presents an analysis of seasonal variations in the brightness temperature of large freshwater lakes (Baikal, Ladoga, Great Bear, and Huron) according to the data of the MIRAS radiometer of the SMOS satellite. The data show the possibility of determining the onset of the destruction of the ice cover. The resulting conclusions are confirmed by model calculations. The actual meteorological characteristics of the region and glaciological features of the studied objects were used as input parameters for the model. The SMOS data were obtained within the framework of the ESA (European Space Agency) project no. 4747 Remote mapping of Siberian saline soils. This work was supported by the Russian Science Foundation, projects no. 15-05-05018, 18-05-00427-a, 18-05-00440-a, 18-05-00753-a, as well as with the support of the topic “Monitoring” (State assignment on the subject of fundamental scientific research, state registration no. 01.20.0.2.00164).